I missed Music Monday this week- with the Ice Storm of 2015 here in Dallas, the city, and any productivity came to a screeching halt yesterday. So I'll just shift it over to Tuesday, even tho Music Tuesday doesn't roll off the tongue quite as well. Last week's selection for Music Monday was "Lullaby for an Anxious Child", which I think of as a song by Sting. But the co-writer of the song, and the version I selected to put on the blog, was by Dominic Miller. After posting that, I looked up Dominic Miller and saw that he has a lot of solo albums. And that he not only has collaborated with Sting, but with lots of other artists as well. As I told my husband the other day, for me, the magic of Sting might just be Dominic Miller. I LOVE his stuff. How I came to play with certain artists and musicians can be traced back to recognizing or having an instinct for opportunities when they have been in front of me. I don't mind saying this is what I am most proud of. Being invited in the mid eighties by percussionist Miles Bould to collaborate together on some demos was one such opportunity which proved to be an important one. This led to him recommending me to play on Julia Fordham's album "Porcelain" (1988), produced by Hugh Padgham. He would go on to produce Phil Collins' album "But Seriously" which was the best selling album of the year ('89/'90) and included the world-wide hit "Another Day in Paradise". Hugh invited me to play on this album which got me noticed by many artists and producers including Sting who I have been working with ever since. I have recorded every album Sting has produced since "The Soul Cages". I have performed over one thousand concerts with him since 1990, spanned over five world tours. He is perhaps the most influential artist to my career and certainly the one I have been with the most. The most significant thing I have learnt from Sting is the importance or quest for growth as a musician. This is why I am still a student of music and my fascination for different genres and disciplines never wavers. I don't see the need to name any more names. These can be found in various discographies on my career. But the single most influential person in my career would have to be my sister Julie who got me started on the guitar when I was very young. When I'm making jewelry, I love having music in the background, but often end up distracted with lyrics. Dominic's solo guitar music is perfect for when I'm repurposing all that pretty vintage jewelry. As a bonus, his guitar playing makes me want to cry. And I love a good cry. So today, for Music Tuesday, I'm choosing another song by Dominic Miller. I guess I've been a fan for many years (thru his work with Sting), but didn't even realize it! Thanks to Music Monday, I made the discovery! This one is called "Eclipse". 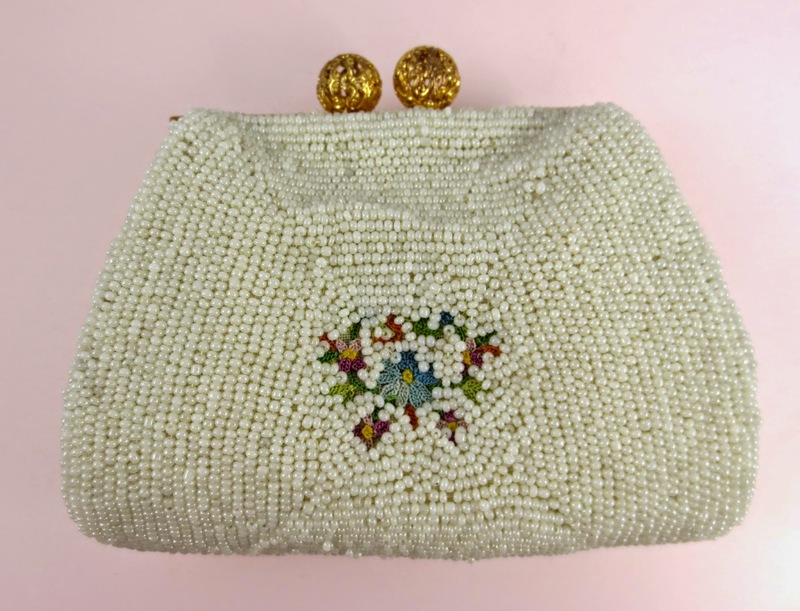 1940s Beaded Coin Purse: They Don't Make 'Em Like They Use To! This is the cutest coin purse I've ever seen in my life. And the detail is amazing! The outside and the inside of this little bag is just exquisite. A silk, or satin interior "MADE IN FRANCE HANDMADE"
Technically, this is a coin purse. But I could never put coins inside of that pillowy interior! It would be the perfect place for some special piece of jewelry. Like an engagement or wedding ring! I am selling this in my Resparkable Vintage Etsy shop. 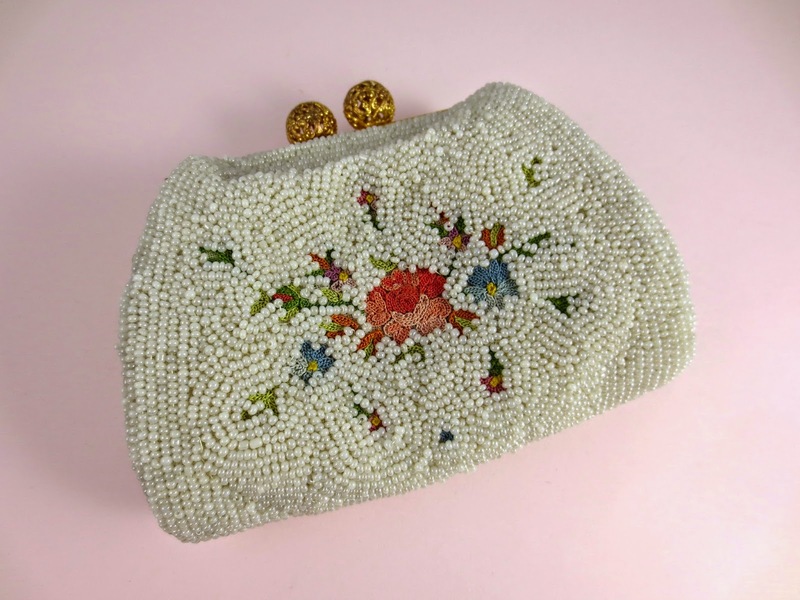 I have a "vintage purse" section, where I offer up almost a dozen beautiful and unique vintage purses, but this is my only coin purse and it is extra special. I believe in that saying, "They just don't make 'em like they use to." This is proof. I first heard this beautiful song, "Lullaby for an Anxious Child" on the "b-side" of a Sting single. Sting ended up re-recording and putting it on a CD, I think it's the "Winter's Night" CD, but that recording isn't nearly as good as the original. So, I was looking for it on YouTube and ran across THIS version~ It's the non-lyrical version, and it's beautiful. Who needs words when you're a baby anyway?! Gorgeous, soothing melody. Dominic Miller is the guitarist who's has been playing with Sting ever since he went solo. He played the gorgeous and memorable parts in some of Stings' greatest songs like "Shape of My Heart" and "Fragile". He co-wrote this one with Sting. In my opinion, this is one of the most beautiful classical guitar songs ever. And it's perfect for this rainy, gray weather we have today. Oh, and if you're a guitar player, here's a PDF link for the guitar tablature for the song. When I'm into something, I'm totally into it. My friend, Valerie, turned me onto this book, The Life Changing Magic Of Tidying Up by Marie Kondo. It's now my bible. And the KonMari Method is my religon. I have tried revamping the organization of all my household stuff thoughout my life. I've bought countless containers and gizmos for organizing. But within a few weeks, or months, things start piling up again and end up feeling like I just don't have enough room for everything. I can't recommend the book enough. I also can't seem to shut up about it. It's my topic of conversation to anyone I run into lately. So this is just one blog post about it. The first one of many, I have a feeling. I seriously considered starting a blog just about my experience using the KonMari Method. But I'll just report here and I'll try not to over do it. But I make no promises. I just figured out my own version of this sweet little song, and after playing it over and over, I still love it! "Shine" by Echosmith. I played it at a church this past Sunday. The second I was told the sermon had something to do with love, I had my excuse to play it in front of an audience! You're probably familiar with Echosmith's current radio play song, "Cool Kids". The whole CD has grown on me, but "Shine" stands out, for me anyway. Perhaps because it sounds way more acoustic than the others, and is along the lines of simple love songs I often lean towards. This video is a live version of Echosmith singing "Bright". Have a great Monday- Fill it with music and love! Okay, I know. It's Tuesday, not Monday. Let's just call this installment, "Music Monday on Tuesday". Just as meaningful, really. I'm choosing "Firework" by Katy Perry for this week's selection. Mainly because I got so sick of reading all the negative comments on Facebook about her Superbowl half time performance. Mean comments ranging from remarks about lip syncing, to being a shallow songwriter, to just calling her whole performance lame. IF Katy was lip syncing, it's certainly not because she can't sing! I'm no expert at determining lip syncing, but it looks like she sang the most challenging song of the night live. And this song was written by someone who has some depth in her songwriting. And it wasn't a lame performance at all. If people didn't like the dancing sharks, I understand, but... it's Katy Perry! She's meant to be fun and a little over the pop top! If you were one of the complainers, please re-watch this with an open mind. I think Katy knows a thing or two!